As a potential car buyer, you’re probably captivated by all of the industry’s new SUV options. However, a few of these potential vehicles may be out of your price range. Luckily, there’s still a way to purchase your targeted nameplate. By pursuing a 2015 model, buyers can obtain all of the capabilities and amenities featured in a 2016 model, but for a fraction of the price. This sentiment certainly applies to the 2015 Chevy Equinox. While the 2016 version of the compact SUV may be too pricey for some prospective buyers, the 2015 should easily fit within a budget. Plus, these buyers won’t be sacrificing any major features or abilities by pursuing this previous-year model, as the 2015 is just as capable as its successor. As used car buyers are shopping for a pre-owned Chevy Equinox, they’ll find that the compact SUV can be equipped with a pair of engine options. The standard 2.4-liter DOHC four-cylinder engine is the more common of the two. Besides offering a solid 182 horsepower and 172 pounds-feet of torque, the Variable Valve Timing and ‘Eco Button’ helps the engine deliver a 22 city/32 highway mile per gallon efficiency. Meanwhile, the 3.6-liter V6 engine offers a best-in-class 301 horsepower and an equally-impressive 272 pounds-feet of torque. These specs play an important role in the vehicle reaching 60 miles per hour in only 6.7 seconds, and they also contribute to the impressive 3,500-pound towing capacity. To put this particular unit over the top, drivers can expect solid efficiency from the V6. Thanks to the Variable Valve Timing technology, the 3.6-liter unit should deliver a 17 city/24 highway mile per gallon efficiency. Regardless of the engine, drivers can rest assured that the six-speed automatic transmission and its accompanying all-wheel drive capabilities will deliver an optimal driving experience. Whether you’re going to be relying on your SUV to trek through the harsh winter conditions or simply get you from point ‘A’ to ‘B,’ you can be assured that the Chevy Equinox is ready to deliver. If there’s one attribute of an SUV that won’t decline due to time, it’s the dimensions. Therefore, drivers can still expect excellent cargo room from their used Chevy Equinox. The Multi-Flex sliding rear seats allow for maximum versatility. Owners can pull the seats forward to unlock an extra eight inches of rear cargo room, or they can hide the seats completely to use the 63.7-cubic-feet of maximum cargo space. The 60/40 split-fold design allows drivers to fit both passengers and any oddly-shaped cargo, and the programmable power liftgate will allow for maximum convenience. Not only will drivers find that they can easily store their cumbersome cargo, but they’ll find that they can load or unload those objects with ease. The interior also offers plenty of technology. The seven-inch Chevrolet MyLink touchscreen provides an array of useful information and applications. Whether drivers want to access their preferred music station, a navigation unit, or even their phone’s basic capabilities, they can do it all via these technological amenities. Best of all, the Equinox includes a built-in 4G LTE Wi-Fi system, allowing your passengers can stay connected during those long road trips, and drivers can rely on their vehicle if they need to do work on the road. There’s a good reason why the Equinox has continually been commended by the Insurance Institute for Highway Safety and the National Highway Traffic Safety Administration, two of the most respected safety organizations in the industry. The 2015 model was highlighted by the rearview camera, which allowed drivers to monitor everything that was happening behind their vehicle via the seven-inch touchscreen. As a result, drivers can anticipate whether they’re about to run into a curb or another vehicle. Meanwhile, the Forward Collision Alert will notify the driver when an accident seems all but inevitable, and the Lane Departure Warning monitors whether the driver is beginning to swerve out of their intended lane. If the driver does find themselves in an accident, the Equinox provides a number of protections to keep all occupants secure. The high-strength body is intended to absorb a collision’s energy, keeping it away from passengers. Meanwhile, the six standard airbags will provide the necessary amount of cushion during an accident. In the event of an emergency, the OnStar Automatic Crash Response system will connect the driver with an OnStar Advisor, who will automatically connect the driver with emergency personnel. Meanwhile, the vehicle will automatically shut off the fuel pump, unlock all doors, and turn on any hazard lights, providing the safest situation for the driver. 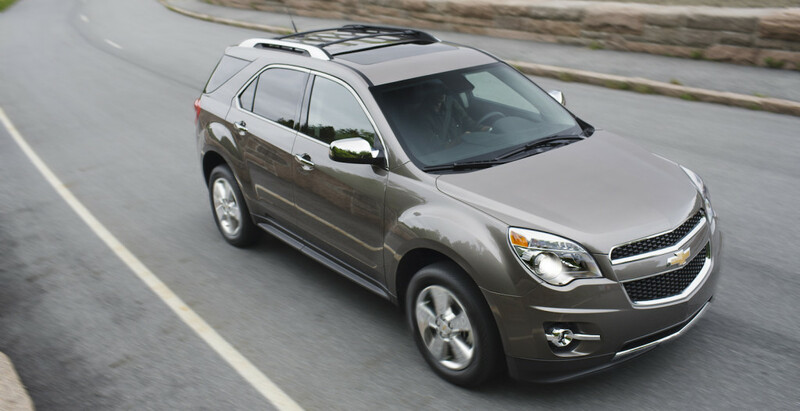 The 2015 Equinox may be a year old, but that doesn’t mean the vehicle is any less stylish. The exterior is as sculpted and rugged as ever, with several of the curves intended for maximum aerodynamics. Meanwhile, the bright halogen head lamps will allow drivers to see… and be seen. Plus, the vehicle is available in a whole host of different colors, so used car buyers should come across a ride in their preferred shade. As you can see, just because you’re opting for a 2015 model, it doesn’t mean you’re sacrificing much in terms of features and capabilities. The engines are just as capable, the interior is still plenty roomy, there’s an abundance of entertainment and safety technologies, and the interior and exterior style is practically unmatched.